I look forward with anticipation to the warmer weather all year long, even more so when we have extreme seasons like we did this past winter. In the summertime I feel freer, happier and more at peace. While many will disagree that 80 degrees Fahrenheit is a comfortable temperature, it’s the perfect one for me. But now that the warm weather looks like it’s dug in its heels, I’m remembering that as much as I love it, it takes a certain amount of caution and planning. Because when the sun shines”as wonderful as it feels”it’s important to remember that it also burns. Using sunscreen is not enough”you have to know precisely how to use sunscreen and the best types to use. And remember: the most hazardous times for UV exposure are between 10 a.m. and 4 p.m.
All sunscreens are created equal, right? Wrong. Although all sunscreens do help prevent sunburn, they are not the same: only some may help lower the risk of skin cancer. Look for broad-spectrum types, which protect your skin from ultraviolet A (UVA) and ultraviolet B (UVB), both of which are harmful to the health of your skin. The American Academy of Dermatology recommends a broad-spectrum sunscreen with an SPF of 30 or higher. Can I use the leftover sunscreen from last year? The answer is twofold: Yes, because the stuff is designed to retain its strength for three years. But also no, because if you are using sunscreen correctly and religiously (more on that in a minute), a bottle shouldn’t last from one year to the next. Tip: If your sunscreen bottle has no expiration date, write down the date you purchased it on the bottle. Dump anything that’s been exposed to very high temperatures or has an off-color or odor. If I put on sunscreen once at the beach or before I go outside, isn’t that enough? Sunscreen should be applied 20 to 30 minutes before you go outside. And it should be reapplied frequently”about every two hours”but more often if you swim or sweat. Without special approval from the U.S. Food and Drug Administration (FDA), manufacturers cannot claim “instant protection” or protection for more than two hours. What’s the best amount of sunscreen to apply? Many of us don’t apply enough. For best protection, most people need about the size of a shot glass (1 ounce) to adequately cover all the exposed areas of their body”and it needs to be rubbed in well. If the size of your sunscreen container is 4 ounces, about one-fourth of it will be used during one application. If I wear waterproof or sweat-proof sunscreen, can I swim or sweat and not reapply it? There’s no such thing as waterproof or sweat-proof sunscreen. In fact, the FDA requires manufacturers to include, on the front label, information about how long a user can get protection while swimming or sweating. Only two times are permitted: 40 or 80 minutes. If it’s cloudy out, do I still need sunscreen? Absolutely. Harmful rays (up to 80 percent) can penetrate cloud cover and even fog; you can still get a sunburn. Be especially careful around sand, snow, water or concrete, all of which can make the sun’s effects even stronger. It’s best to also cover your head with a hat and your eyes with sunglasses, because sunscreen does not protect you 100 percent. If I use other skin products, when should I apply sunscreen? Moisturizer first, then sunscreen and then makeup. If you also use bug spray, make that your last step”putting sunscreen on top of bug spray renders both less effective. Do I still need sunscreen if my makeup contains an SPF? We all know that wearing sunscreen each day is an important part of preventing skin cancer as well as premature signs of aging. For many women, that means choosing makeup with SPF built in. However, experts now say that the sunscreen included in your makeup is not enough to protect your skin on its own. The primary reason is that most of us only use a small amount of foundation or BB cream–much less than we would put on our skin if we were applying sunscreen alone. Experts estimate that you’d need to use seven times your normal amount of foundation to get the coverage you need to protect your skin. In addition, many people don’t reapply makeup during the day, while sunscreen is typically only effective when reapplied every two hours. So if makeup isn’t enough, what should you be doing to protect your skin? According to the American Academy of Dermatology, everyone should use a daily sunscreen with a sun protection factor (SPF) of at least 30 that is water resistant. While sunscreens with higher SPF do offer a little more protection, those higher than 60 don’t offer any additional benefits. 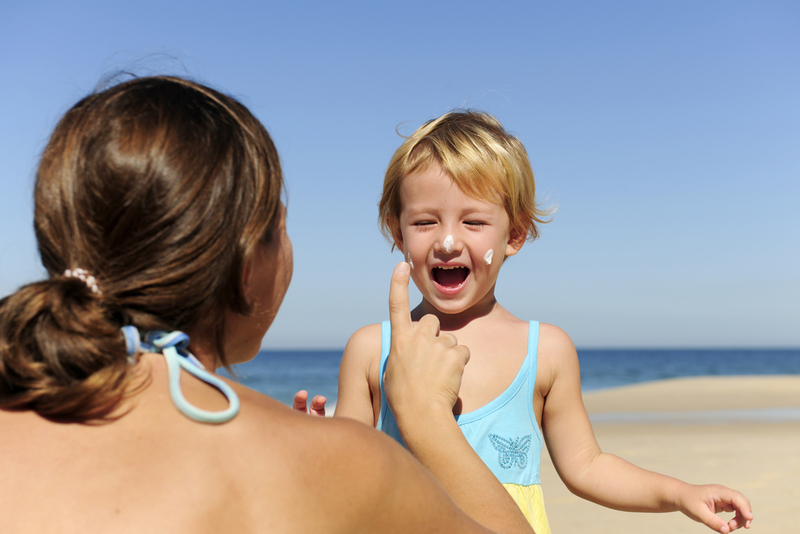 Look for a brand labeled “broad spectrum protection,” which blocks both UVA and UVB rays. Avoid sunscreen sprays; the Food and Drug Administration is still evaluating these products, and is concerned that they do not allow enough of the sunscreen to make it onto your skin. Applying sunscreen properly is also important. You should use about one ounce, which is enough to fill a shot glass, and apply to all exposed areas of skin about 15 minutes before you go outside. Remember that sunscreen does expire, so check the date on the bottle each year before you plan to go out in the sun. In addition to sunscreen, you should cover as much of your skin as possible with light colored, loose fitting clothing when out in the sun, as well as a wide brimmed hat and sunglasses. If you’re at risk for developing skin cancer, avoid the sun between 10 a.m. and 2 p.m., which are the peak hours for sun damage. A good solution for many women is to opt for a moisturizer with sunscreen rather than relying on makeup with sunscreen. Just make sure that if you go this route, to use plenty and reapply frequently, especially if you’ve been sweating or go swimming. At Dermatology Associates, we understand the importance of skin care and sun safety. Sun damage not only leads to premature signs of aging, but also can lead to skin cancer. Protect yourself from the sun every day, not just at the beach or the pool. We provide dermatology services and cosmetic treatments to help you keep your skin looking and feeling its best. Contact Dermatology Associates today to schedule a consultation with a member of our medical team. recent study, conducted by scientists at Manchester University and London’s Institute of Cancer Research, has left them questioning the effect of sunscreen according to a report published the journal Nature. Sun exposure has long been known as a risk factor for melanoma skin cancer (the most common form of skin cancer). However, until recently, the molecular mechanism by which UV light damages DNA in the skin has been unclear. This recent study looked at the effects on UV light on the skin of mice at risk of melanoma, and concluded that wearing sunscreen alone is not enough. While in the short term, and SPF (aim for a factor 30 or 50), does help to protect the skin, sunscreen is not a reliable way to prevent skin cancer, which can be fatal. “People tend to think they are invincible once they put it [sunscreen] on and end up spending longer out in the sun, increasing their overall exposure to UV rays,” Dr Julie Sharp, of the Cancer Research UK was quoted in the report on the study, published by the Daily Mail.